USA Today reported that a major office product manufacturing company recalled 1.4 million task chairs when it found that one of the components of their chairs kept breaking, causing the chairs to be unsafe. We want to ensure you never put yourself or others at risk by buying a chair that is of low quality or falsely labeled as ergonomic. That’s why we have created this blog series, to help you understand the difference between other office chairs and the BEST office chair for you. When picking out a chair it’s important to look at each component separately. Consider body size and shape, the tasks that the chair will be used for and the position typically taken while working. For example, someone working on a computer at a desk does not have the same seating requirements as someone who works on an assembly line in a factory. When choosing ergonomic seating, it’s critical to look for the highest quality possible and not just for right now, but quality that will last. You want a chair that will ensure long-term comfort, meet health & safety commitments and guarantee sustainability standards are met. Investing in seating that will provide long-term value is key to keeping a workforce healthier and more productive. If the chair you are purchasing is of the highest standard, it will meet the requirements of these organizations who specialize in certifying furniture; ANSI/BIFMA, Greenguard and ISO 14001. You can read more about their requirements here. One of the most important things you need in a chair is adjustability facilitated through the chair’s controls or levers, so that you can adjust the chair to fit your body instead of trying to adjusting your body to fit into a chair. 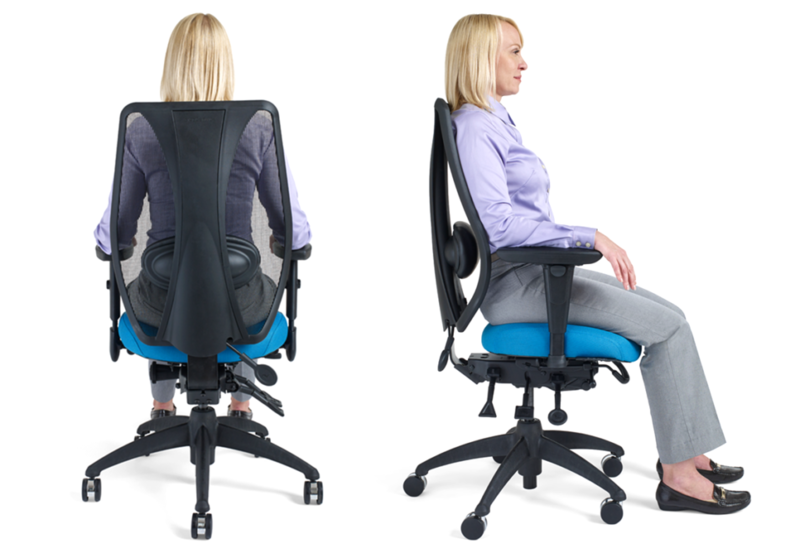 The chair you buy should have pneumatic seat height adjustment to allow the seat height to be easily adjusted and act as a shock absorber when sitting, which is important in order to reduce pressure around the buttocks and spine. Being able to easily adjust your chair height is important in order to sit comfortably at all times. The best seated height position for you, is sitting all the way back in your chair with your feet comfortably placed on the floor. Note: If you do not have a height adjustable desk you may find that your desk is too high or too low to get into this position. Instead of adjusting your chair or your body to the height of the desk, invest in either a footrest, so your feet are still planted, or a screen mounting accessory, so that you can sit comfortably in your chair and at your desk without compromising your wellbeing. It’s important to recognize how much movement is made while seated at a desk. Even if you don’t have a large or L shaped desk, you tend to make slight movement all day doing small thing like, making notes or even reaching for the phone. So if you sit in a static chair your body is constantly twisting and being strained. That’s why you need a chair that swivels so you don’t have to twist. Coming up in, The Guide to Selecting the Perfect Chair, we are going to start breaking down each component of the chair and what to look for no matter who the chair is for. Check out part two to find out why the size of an office chair seat matters. I’ve been thinking about surprising my husband for his birthday with office makeover! Getting him a comfy chair is at the top of my priority list. I love what this tip says about adjustability. I know my husband would appreciate being able to control how a chair fits his body. I’ll make sure to pay attention for that sort of thing. Thanks! To help us recommend an appropriate chair for you it is helpful to have a little more information. If you complete the form found on this page http://www.ergocentric.com/fit-every-employee a Customer Service Representative will get back to you in no time. I am delighted with my ergoCentric chair! I’m completely happy with it! Bottom line…after sitting in this fully adjustable chair, I can sit for hours on end an get up without being sore or in pain! I HIGHLY recommend these amazing ergonomic office chairs !! !